I’m getting ready to do the show in Philadelphia sponsored by the Susan Quinlan Doll & Teddy Bear Museum. The show always features a special gallery of one of a kind pieces done by the attending artists. 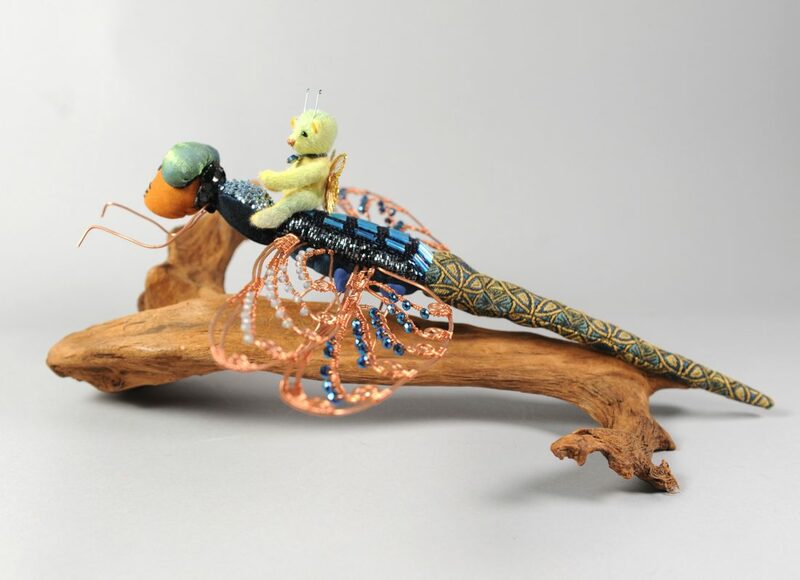 For this year’s gallery I had an idea of a bear riding a dragonfly. I started with a basic sketch, just to remember the idea. This is obviously not to scale, but it helps me to get started. The bear sketch is typical of my work – I create a pattern based on this side view sketch. 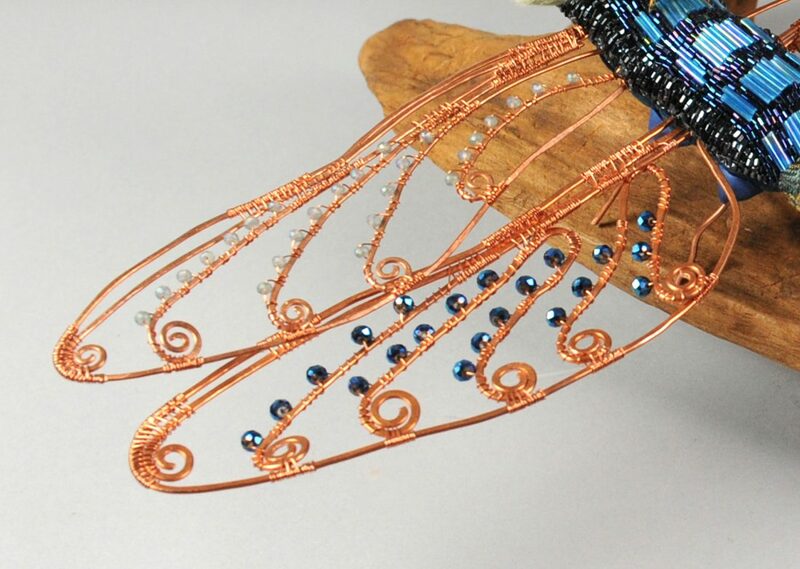 I began by making the wings of the dragonfly using copper electrical wire scrap in 12 and 14 gauge and 22 gauge jeweler’s copper wire for the wrapping, adding faceted crystal beads in two shades of blue. Once four wings were done, I needed to figure out an armature for the body and then begin creating patterns for the body pieces. 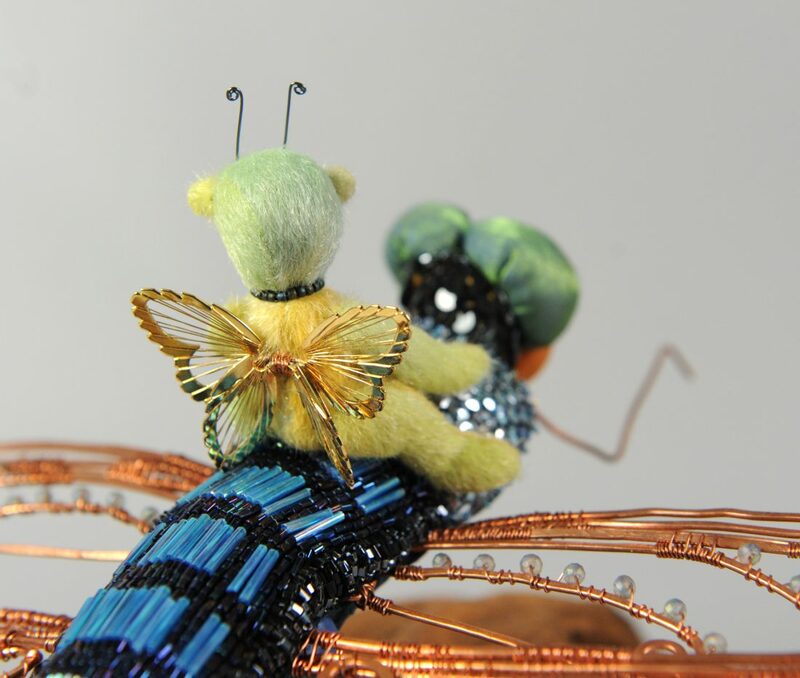 I knew I wanted to do beadwork on the thorax, so that was done before the pieces were sewn to the armature. After stuffing and closing more beads were added. Same for the upper thorax with sequins and beads. The tail was sewn then stuffed and drawn over the end of the wire armature. The body and tail pieces were made using upholstery fabric samples. The head was made with a velvet like fabric and the eyes from some shimmery fabric from a thrift store blouse. I did some embroidery on the front of the head and added more sequins and beads to the back, then attached the head to the body. 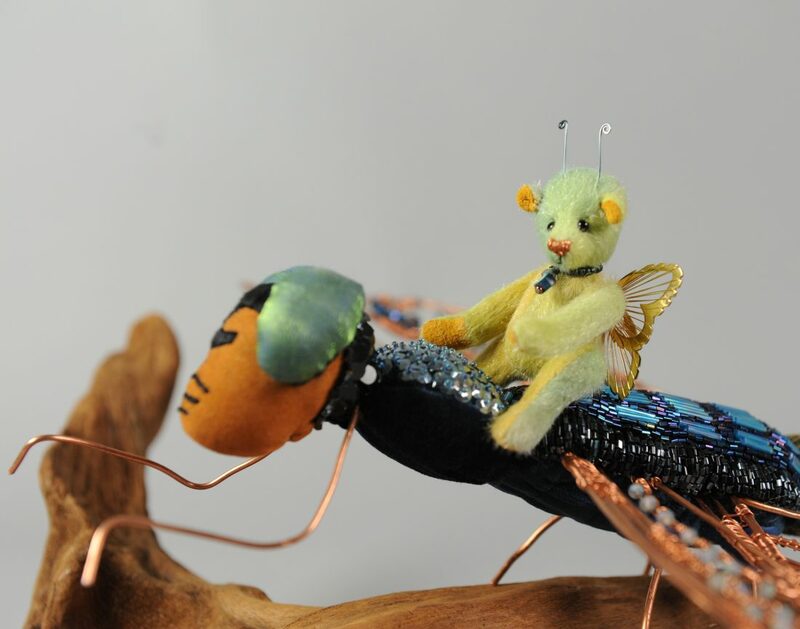 The fairy bear was made from specialized miniature plush fabric in a tie-dye yellow and green palette. He is jointed at the head, arms and legs with internal disc joints. He has glass eyes and a nose stitched from metallic embroidery floss. His wing were from a salvaged butterfly brooch and his necklace is of tiny seed beads with a floral pendant drop. The fairy bear is 3″ tall. 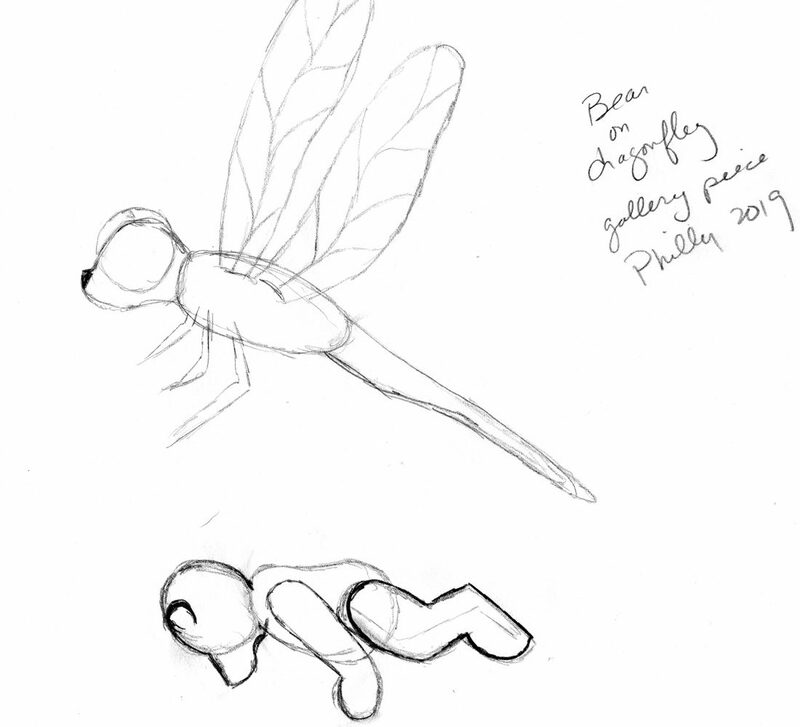 The dragonfly is 16″ long with a 16″ wingspan. I’ve displayed it on a piece of driftwood. 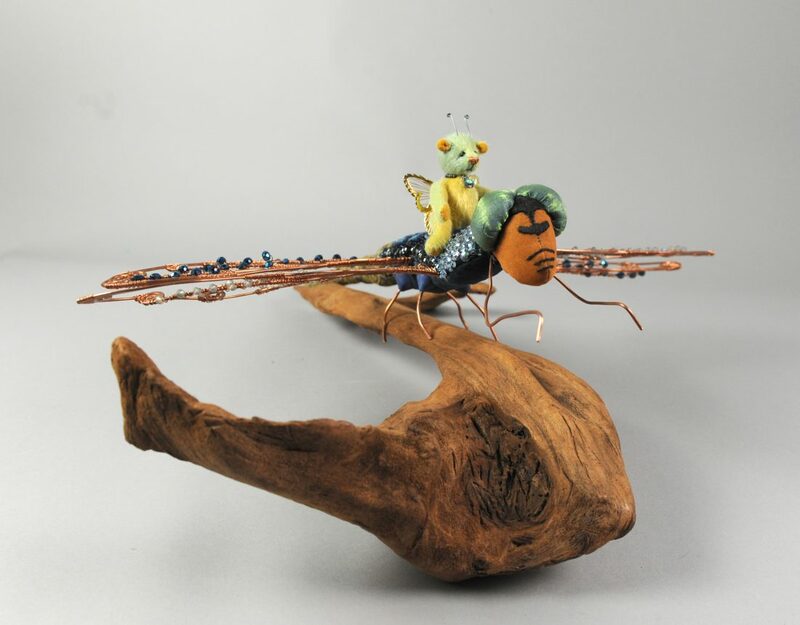 The piece is called “Summer Joyride” and will be at the show in Philadelphia on May 2, 2019. 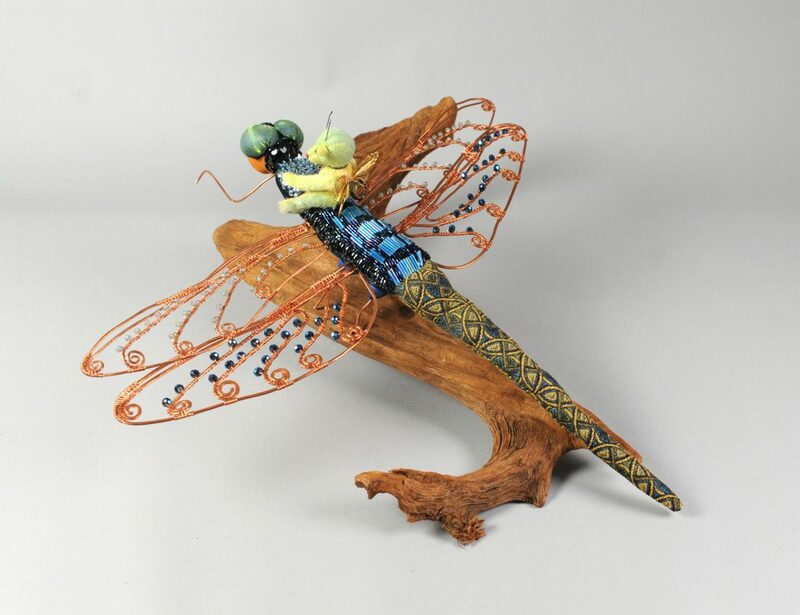 This entry was posted in beading, recycled creations, teddy bears and such and tagged artist bear, dragonfly, miniature bear, soft sculpture, teddy bear, teddy bear show. Bookmark the permalink.